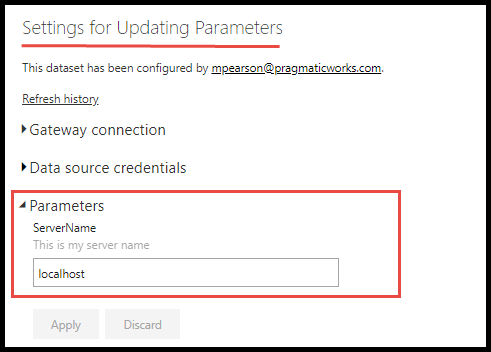 In this quick tip I want to share how you can update Parameters in Power BI from the service. Previously, this was not an option and Parameters could only be updated from Power BI Desktop. To update parameters, navigate to the Datasets section in the Power BI Service. Next, click on the schedule refresh icon. Updating parameters is done from the schedule refresh window. Click on Parameters from the schedule refresh window. Once expanded you will see available parameters, simply update the parameters and you’re done!